Leading Manufacturer of side entry agitator from Pune. We are remarkable entity, engaged in offering high quality Side Entry Agitator to our clients. The offered agitators are manufactured by our qualified professionals in line with industry norms from optimum quality components and the latest technology. In order to ensure their quality, these agitators are strictly tested on different parameters. 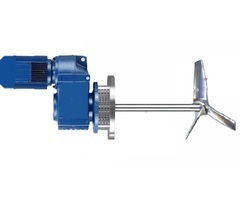 Moreover, clients can avail these agitators from us at nominal prices. Looking for Side Entry Agitator ?